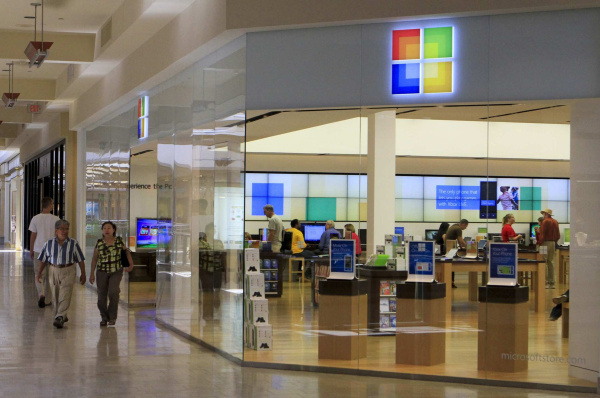 The first Microsoft store in Oklahoma opens at Penn Square Mall in Oklahoma City on Saturday November 15, 2013. The opening is just in time for the holiday launch of Xbox One on November 21st in which Microsoft anticipates selling more than 1 million units in the first 24 hours. On Sunday country superstar Tim McGraw will perform in celebration of the opening. The concert is free, but tickets are limited to the first 1,500 at the grand opening. Opening ceremony will begin at 10:30 a.m. Saturday and the doors will open at 11 a.m.
Microsoft will be giving away more than $1 million in software grants to local organizations as part of Saturday’s grand opening ceremony. Grant recipients include $100,000 to The Education and Employment Ministry (TEEM); $250,000 to Girl Scouts of Western Oklahoma; $250,000 to YWCA Oklahoma City; $300,000 to The United Way of Central Oklahoma; and $450,000 to The Children’s Center. The Microsoft store features Surface tablets, Windows Phones, Xbox with Kinect, Office products, and much more. Matrixforce is providing exclusive Microsoft Gold Partner discount cards for 10% off store purchases through June 2014 at the Cox Convention Center for all attendees who visit the Microsoft device bar during the Oklahoma CPA Society Technology Conference November 14-15, 2013.